Sejla is the daughter of Greenfield maintenance lead technician Adnan (Ed) Sacic and his wife Alma. She is a 2012 graduate of Robbinsdale Armstrong High School and is currently completing her freshman year at the University of Minnesota, where she hopes to be accepted into the College of Pharmacy. Sejla spent her high school years involved in a variety of extra-curricular and volunteer activities, including acting a Best Buddy to a disabled person, being a member of the Link Crew that helps freshman students on their first day of high school, and serving on the Student Activity Board that plans special events. 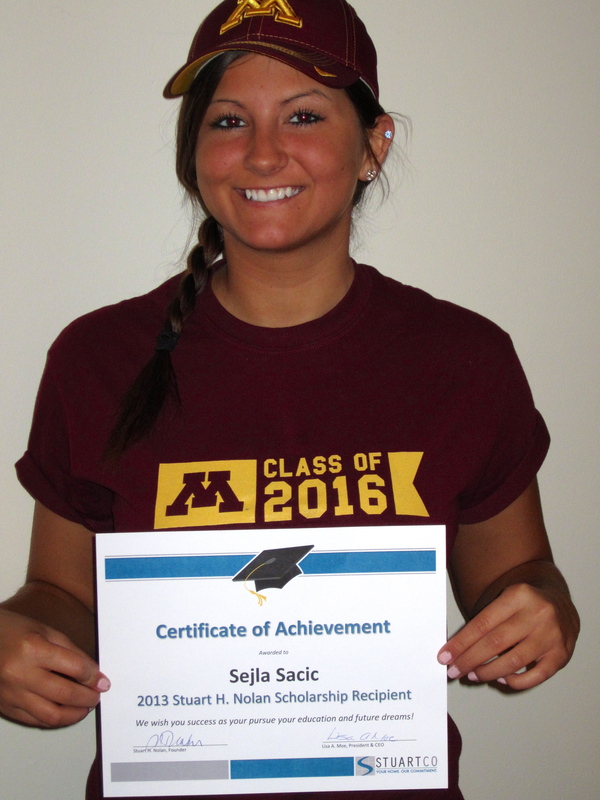 At the U of M Sejla is involved with the Pre-Pharmacy Club, the Medical Reserve Corps, and the Student Advisory Board. She has also volunteered for Team McDaniel and the Ronald McDonald House. Sejla’s family immigrated to the United States from Bosnia when she was four years old. They arrived with just a small amount of money and a big goal of achieving a better life. Ed & Alma worked very hard to achieve that goal for their family, and Sejla wishes to repay them by making the most of her educational and career opportunities. Sejla was selected as this year’s Stuart H. Nolan Scholarship recipient from a field of five excellent applicants. This outstanding young woman has received a check for $2,000 to help offset her educational expenses, including tuition, books, meals, transportation, and other fees. We congratulate Sejla and all who submitted an application; we wish you all success as you pursue your dreams!